Danny Granger didn't blink, and Sixers president/general manager Sam Hinkie acquiesced to a buyout with the wingman they acquired from the Indiana Pacers for Evan Turner and Lavoy Allen. Granger got what he wanted and presumably will sign with a team that has a shot at competing in the 2014 NBA Finals before hitting the market as an unrestricted free agent. This is a business. Doing Granger a favor is not what Hinkie was hired for. The Sixers had one minimal asset with Granger, his Larry Bird rights. Had they kept those, and him, they might have found a partner for a sign-and-trade this summer. Now Granger can go do whatever the hell he wants and the Sixers get nothing for Turner, a still-young former No. 2 overall pick. Turner and Allen hit the jackpot by going from one of the NBA's worst teams to the one with the best record in the league. Even center Spencer Hawes now at least has playoff hopes with the Cleveland Cavaliers before becoming an unrestricted free agent. Hinkie earned some brownie points with owner Josh Harris by saving him some of the remainder of Granger's contract. The final trade-deadline score is players 4, Hinkie 0 - unless you count four late-second-round picks as legitimate assets. I know Hinkie is trying to position this franchise to build for the future, and he certainly had a huge mess to clean up when he got here. But don't tell me that what has happened in the last week played out the way he had designed it. If it did, the Sixers are in a bigger mess than what is clearly obvious. There is no way you can make me believe that, at the beginning of the season, Hinkie looked at the only tradable commodities he had - Turner, Hawes and forward Thaddeus Young - and said, "By the trade deadline, I will get four second-round picks out of it that are worth little." That's not a successful rebuilding move. Anyone looking at this with even a little bit of logic figures Hinkie was shooting for at least three first-round picks. That was a trade-deadline agenda you could at least jump on board with, one that actually gave some hope for the rebuilding. As it turned out, the Sixers got nothing. Any argument you make can be countered with one that says nothing was gained. By tanking, the Sixers increase their chances of getting more pingpong balls for the lottery. The Sixers had displayed little pulse before trade day, and, with depression from a lack of talent settled in, there was no way this squad would finish with anything better than the second-worst record in the league. In fact, it could be argued that with Turner, Hawes and Allen sleepwalking the rest of the season, the Sixers could not luck into a few extra wins because some young guys might play hard to show they belong in the league. They saved salary-cap space with the trades. Umm, Turner, Hawes and Allen were already coming off the books. By adding reserve center Byron Mullens and reserve guard Eric Maynor, Hinkie actually added contracts with player options for 2014-15 that combine to more than $3 million. I understand Hinkie is doing what most Sixers fans think should be done - tear it down to build the future. I've said over and over that I'm on board with that, but I don't have the blind faith in Hinkie that a lot of people seem to have. What he has done should be examined, not simply brushed over. Hinkie made a bold draft-night move by trading Jrue Holiday to New Orleans for center Nerlens Noel and a likely lottery pick in 2014. He also selected rookie-of-the-year favorite Michael Carter-Williams with the 11th pick when others questioned him. I'd like to believe Brett Brown was the correct choice for coach, even though it's hard to evaluate him, because Hinkie gave him dreck impersonating talent. Some will say that was enough. I say it should be only the start. I don't believe in throwaway seasons. Better things could have been done, while still achieving the plan. 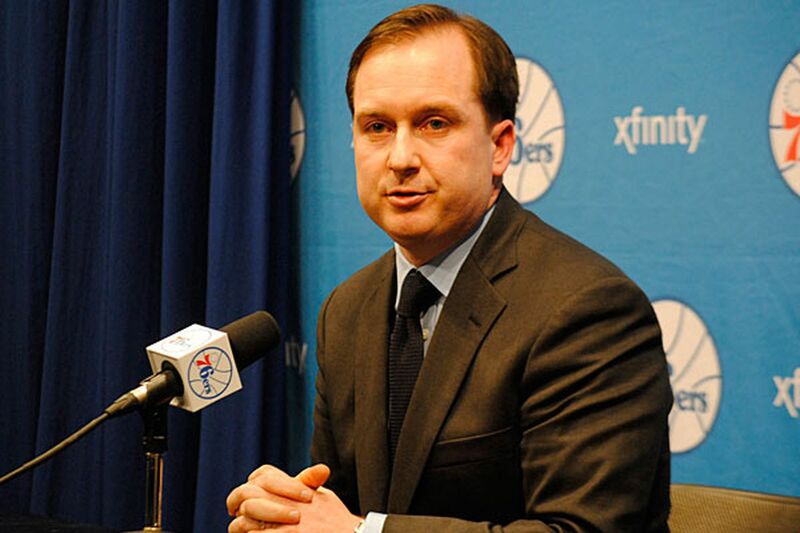 Hinkie has spent a lot of time in his Bat Cave devising his "For-his-eyes-only" plans for trade day. The results were huge letdowns. I'll take tangible assets over wishful thinking every time. Obviously, Turner and Hawes were worth only second-round picks last week, but what about in January, when both had been posting significantly better numbers? Did Hinkie hold his hand too long and let their value decrease as their numbers slipped? If you know you ultimately will sell, shouldn't you do it when stock is high? Cleveland gave the Chicago Bulls a protected first-round pick, a second-round pick and the waived salary of center Andrew Bynum for forward Luol Deng. Yes, Deng is a two-time All-Star, but Young was having a comparable season for the Sixers, and his career stats are close to Deng's. When you consider Deng makes $14 million this season and will be a high-ticket unrestricted free agent, you have to wonder whether Hinkie could have convinced Cleveland that Young, who is locked in at under $10 million for the next two seasons, was a more sure option. The fact that eight Sixers have no guaranteed contracts for next season says how disgustingly bad this roster truly is. Hinkie's big tests will come this summer when he can use the draft picks he acquired to make some moves and to try to persuade some decent free agents to take some of the ample salary-cap space the Sixers will have. I'm not saying he won't get it done, but for a guy who started out with a bang, the rest of the season has been a whimper.